Hi there friends and fellow crafters. LeeAnn here with my project this week for White Rose Crafts. Today I am using add-on's for the Legends of the Sea Limited Edition Card kit, and had fun doing so. For this project I used the layered shell stickers, and the baby blue card base that came with the kit. 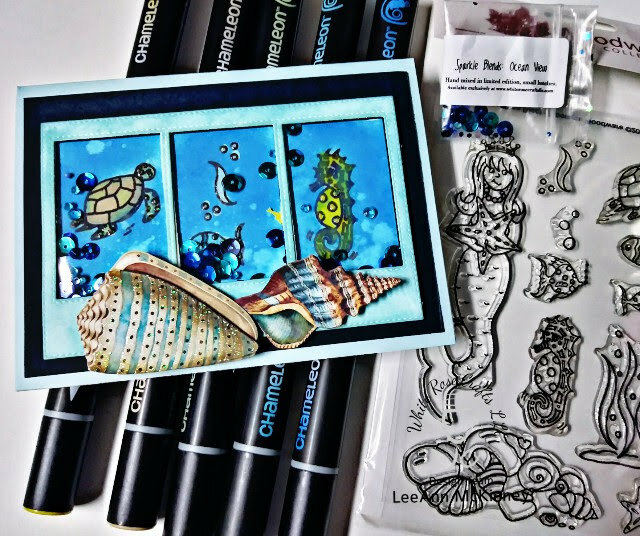 I also used Mermaid & Friends stamp set from Woodware UK. I used Doodles Paper Playgrounds Sparkle Blends in Ocean View in my shaker element. My images were colored using Chameleon Markers, while the I used Distress Oxides in Salty Ocean and Broken China for the water. I hope you have enjoyed this project today. Please see the great products available at the White Rose Crafts online store. New Crafty Toy Haul... All Video's!! !